UPDATE: Based on your feedback, we’ve created a Tablecloth Finder to help you find the right sized tablecloth — try it out and tell us if you like it! 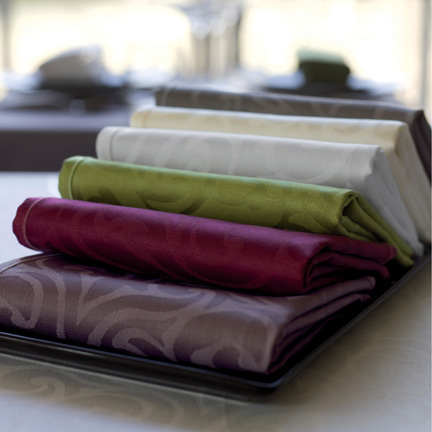 Table linens are essential for setting the right tone to your event and they can really transform a space. 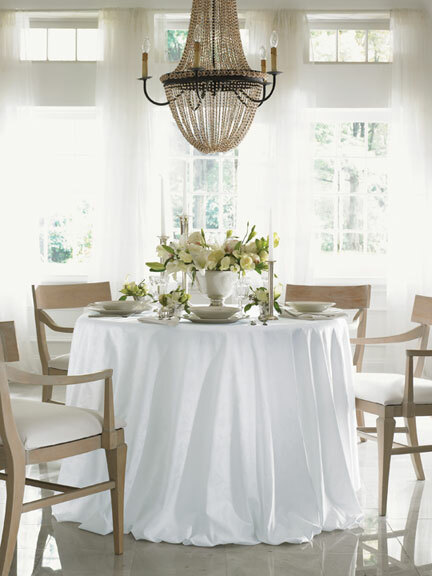 Choosing a tablecloth is easy; here are answers to our most frequently asked questions. What should I look for in fine linens? Fine linens are characterized by a combination of beautiful materials, expert construction, fine workmanship, and design. 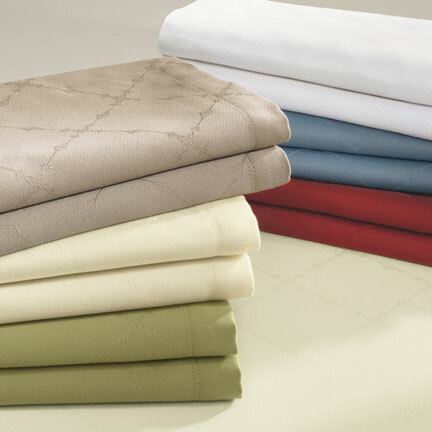 Most fine linens are made from linen or cotton because they are durable, absorbent, and soft. What material should my table linens be made from? For ease of care, there are high quality easy-care table linen collections available which are either stain-resistant or wrinkle resistant. Both linen and cotton are natural fibers. Linen comes from the flax plant, which grows in the cooler climates of western and northern Europe. Cotton comes from the cotton plant, which grows in hot, humid climates throughout the world. Both fabrics are highly absorbent, durable, and become softer with use. There are some subtle differences, however. Linen feels lighter and crisper and becomes whiter with use. It is also highly absorbent and lint-free. Cotton feels more substantial and is will shrink more than linen. What determines quality in cotton fabrics? Quality in cotton is primarily based on the length of the fibers. This is because longer fibers can be spun into smoother, stronger, and much finer yarns, which can then be woven to create fabrics that are softer and more durable. In particular, Egyptian cotton is prized because the humid weather and rich soil around the Nile delta produce especially delicate and long fibers. Cotton grown in Egypt has a staple length of over 2 1/4″, twice the size of that in generic cotton and 60% longer than Pima cotton. What determines quality in linen fabrics? Like cotton, higher quality linen fabrics are made from longer fibers because these produce finer and stronger yarns. In addition, these fibers have a very consistent thickness with almost no coarse knots or uneven slubs, resulting in a smooth hand. Irish and Belgian linen are widely acknowledged to be among the finest linen in the world. What are standard table linen sizes? For more information, view our basic chart of tablecloth sizes and the tables they would fit. For formal settings, tablecloths should hang down 10″ to 12″ around the table. More elaborate occasions may call for a drop of anywhere from 15″ to 30″ (all the way to the floor). The longer the drop, the more dramatic the effect. In contrast, casual events call for cloths that have 6″ – 8″ drops. For round tables, measure the diameter of your table and add twice the desired drop. Following the example above, 48″ round tables would require 72″ round tablecloths. What shape should my tablecloth be? My table has several leaves. What size tablecloth should I buy? If the table is extended and shortened often, purchase separate tablecloths to fit each size. If this is not possible, you can buy a cloth that fits the size of table that is used most often, and purchase more affordable banquet cloths for larger affairs. Another solution is to simply buy a cloth to fit the largest table, and use it at all times. A third possibility is to go with a nice set of placemats and napkins. Yes. If you can’t find a standard size tablecloth that fits your table, we are happy to offer custom sizes in many collections. How many table linens do I need? What design should I choose for my table linens? Generally, formal linens are either solid, woven with a pattern, printed, or embroidered. White and ivory are the most traditional colors. Printed designs and more colorful embroideries, more suitable for informal settings. Unlike a print, a damask or jacquard refers to patterns that are woven into the fabric of the cloth, creating a subtle, yet elegant look. Although it is a common misconception that the term “damask” refers to a heavy cloth, damask patterns may be woven into fabrics of any weight. What colors should my table linens be? White is the most popular color for table linens and it is always appropriate for formal dining. Ivory and off-white colors are a popular second, especially in rooms with warmer tones. Beyond these, colors are wonderful for highlighting special elements in your tabletop collections or to celebrate festive occasions. What should I consider in choosing linens for a special event? 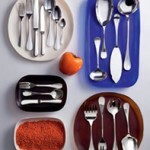 – Location: Choose colors to complement the existing décor of your dining room. For outdoor events, let the setting be your guide. Generally, bright colors look better in sunny locations, while pastels are wonderful in garden settings. – Season: Spring and summer colors tend to be lighter, while bolder colors are more appropriate during the colder fall and winter months. – Theme: Colorful linens are one of the most effective ways to set the mood you want to create. Vibrant colors add drama, while soft colors evoke a more refined atmosphere. Why do I need a table liner? Although designed to last a lifetime, fine table surfaces are often exposed to excessive wear and tear. To help protect your tables, thick felt table liners are designed to reduce noise and protect your tabletop against heat and scratches. Unlike ordinary liners, these are plush and generously sized (approximately 5″ larger than your table) to extend over the edge of your table in order to create a softer drape underneath your fine linens. To read more, see Protecting Your Table with Felt Liners. What size table liner do I need? Most fine linens can be laundered at home. Cottons and linens should be washed with like colors in cool water using a regular (non-bleach) detergent. 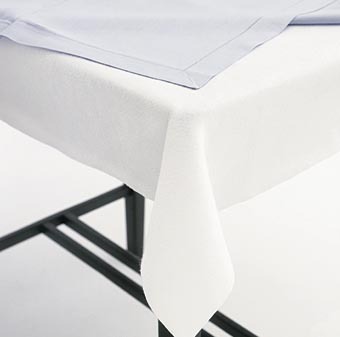 Stains should be treated as soon as possible using a stain remover such as our LeBlanc Linen Wash. Bleaching agents such as chlorine, peroxide, or sodium carbonate should not be used. Linens can be dried, but should be removed from the dryer while slightly damp in order to minimize wrinkles. They should then be spread on a large surface and pressed with a hot iron. When ironing embroideries, place them face down on a towel and press on the reverse side. Taffetas, silks and laces should generally be dry cleaned, especially if the items are delicate or have decorative fringes. Are there specialty linen cleaning solutions? 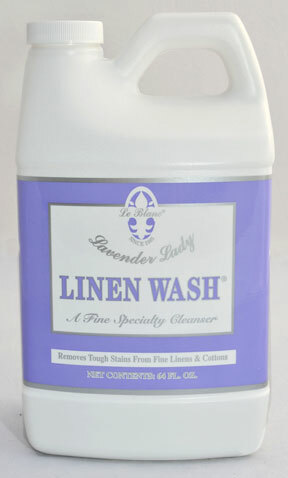 LeBlanc Linen Wash is a specially formulated cleaning solution for laundering fine linens. Its gentle, pH-balanced formula may be used on all natural fibers, synthetics, and blends. We particularly like it because it is concentrated, so it is effective on linens (including vintage linens) without the use of bleach, caustics, or phosphates. LeBlanc Linen Wash has been tested to remove lipstick, jam and jelly, fruit juice, coffee, tea, chocolate, red, wine, grease, cola, ink, and oil stains. Do I have to iron my fine table linens? For formal dining, we do recommend that you iron your fine linens. After washing, simply lay your slightly damp linens on your table over large towels or a felt table liner and press with a hot iron. Of course, you may also have your linens professionally pressed for a small charge. Preparing linens for storage is easy. Make sure linens are completely clean and dry. Avoid starching them prior to storage. Fold items gently and store them in a cool, dry, and well-ventilated area. Do not store linens in plastic bags or cedar chests or in basements, attics, or garages to prevent large fluctuations in humidity and temperature. Check your linens periodically to ensure that they are clean and dry. 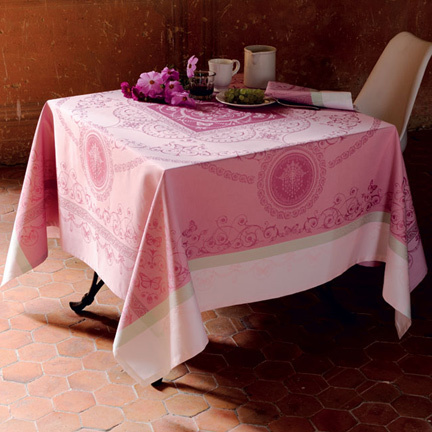 To view all our collections of table linens, click here. I have a long oval table 54x 192 need a tablecloth for that size . can you get in touch with me. Your chart says that, for my 48″ table, I should get a tablecloth 72″ wide. But I can’t find ANY that are wider than 70″. I have looked all over the internet. WHERE does one get a cloth for a table 48″ wide? It’s approximately 72″ so a 70″ wide tablecloth should be fine. 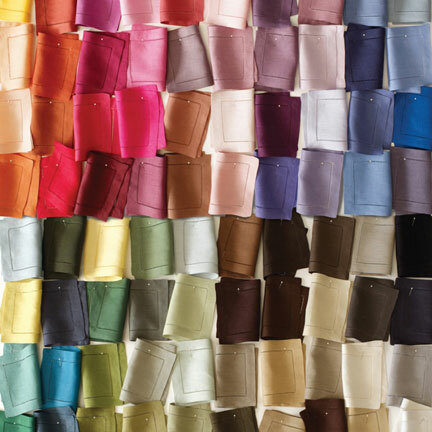 I am trying to order some linen napkins, but I am having trouble picking a color and the quantity. I am not sure what I am missing in navigating the website. Should my tablecloth match my dinning room curtains? Not necessarily. Curtains typically are stronger colors or damasks, whereas the tablecloth is a background for the table setting and entertaining. Also, if your curtains are used to block out light or the outside, the tablecloth does not have to be so dark or heavy. It probably takes a week or so. Please contact our customer service for more information. Does one place a fine linen placemat on top of a matching table cloth ever? Yes you can definitely do that. Either the placemat or the tablecloth could also work on its own. Thanks for the great article! I learnt a lot 🙂 I will send my customers here for an explanation about the differences between cotton and linen. Thanks again!